The idea of offering pencils in my shop has been on my mind for awhile. With Valentine’s day coming up I thought they would make a nice favor for kids to add to their Valentine’s cards since a lot of schools don’t allow candy. 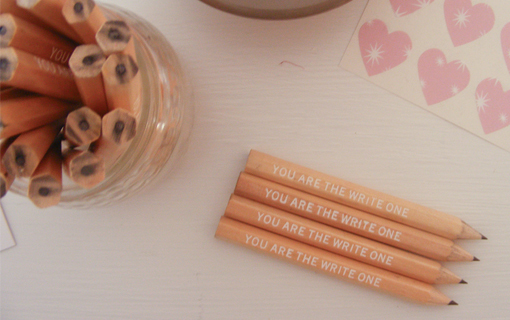 My sister came up with “you are the write one” and I foil stamped it on some natural wood pencils. I went with golf size pencils so they will fit into my valentine cards so kids can stick them right in the envelopes. That’s adorable! You have one smart sister! Yes, your sister must be brilliant! Does she get a percentage of the sales? Or maybe a discount on her kiddo’s valentines?? ?